As the grant period draws to a close, I look back in gratitude for the opportunities the award has brought, and I look forward in excitement to the next steps of my journey. Besides helping me to purchase art supplies and to prepare for three exhibitions, the grant also helped to fund a recent trip to explore the art scene in a different part of the country. I wanted to get a pulse on the art that is being exhibited and appreciated in a place that is often referred to as the 'center of the art world'. Where else, but New York City. I stayed in an Airbnb in Midtown, about three blocks from Penn Station. Because of my central location, I was able to connect to different subway lines easily, and I could walk to the Chelsea Arts District in about 15 minutes. The weather was mostly ideal, in the mid-fifties during the day and mid-forties at night. The colors of the leaves were still changing, so there was a broad range of lush green to golden to bright red to bare. It was so fulfilling to be in the midst of the busyness; everywhere I turned there were artists and creative projects underway. On the last day there, the temperature's high was 35. My souvenirs from the trip became new thick socks and a wide scarf to cover my face...in addition of course to the wealth of photographs, complete immersion in fall weather, and new perspectives, ideas, and relationships. Now back at home in my studio in Florida, a better-informed version of myself begins again with a blank canvas, wondering where it will take me this time. "Big Sur II" (left) and "UCSC" (right) at the former Gulf Coast Museum of Art in Largo, FL. Last Thursday we celebrated the opening of the Emerging Artist Grant recipients' exhibit. And what a beautiful space we were afforded - the bright and spacious former Gulf Coast Museum of Art. I displayed the two main works that I completed during the grant period, "Big Sur II" and "UCSC." They are each 4' x 5' in scale, and finding the space to show such large work can be a rare opportunity. But the spaciousness of this former museum afforded viewers the chance to really experience these paintings exactly as I intended. The event began at 6:00pm, and when I arrived at 6:15, the parking lot was packed. Inside, people were talking, enjoying the hors d'ouvres, and viewing the art. It was probably the largest crowd I have seen at an opening of which I am a part. An hour into the evening, we had the pleasure to experience performances by the dancer, poet, screenwriter, and musician who received grants. Throughout the night, I talked with friends and family who came to support me and met new people as well. "My work is completed by the viewer." The idea could be akin to a singer who channels deep emotion through voice, and when it is performed before an audience, only then does the release come. The spirit is expressed and acknowledged, and what more could one ask for? As we flounder here in consciousness, perhaps our most basic human need is to have our existence validated. And when the spirit of art - a life in itself - is validated, then my job as artist continues. Last Thursday night, the creative spirit in me was acknowledged. So thank you to everyone who came to the show and to everyone at Creative Pinellas who made this possible. New work is on the way; stay tuned. Now in its third year, Young Artists of Florida gives children of the Florida Sheriffs Youth Ranch an opportunity to dabble in art and benefit from its therapeutic effects. The participating children, whose ages range from about 7 to 17, visit the Museum of Fine Arts every other week for a six month period and learn from local artists who volunteer their time to teach and assist. Last year was my first year volunteering with the program, and I served as an assistant. This year, I wanted to be even more involved, so I volunteered to teach. October 7 marked the date for my class. One might assume that I would be teaching painting since that is my own medium of choice. But, because many of the previous classes have revolved around drawing, sketching, and two-dimensional processes, I wanted to give the children a new experience. I decided on a project that would demand their full attention, something where they could get really messy and divert their focus from whatever troubles they might be facing from being separated from their families. Thus, I chose paper mache. More specifically, we would make "balloon bowls." When the students arrived, they were welcomed by a plastic-covered floor and tables lined with piles of newspapers next to aluminum pans filled with flour. Only a couple of the 24 students knew how the materials would be used. After watching a brief slideshow about paper mache, we got started. The students inflated balloons and attached a cardboard base. We then tore the newspapers into strips while the assistants walked around to each table pouring water into the aluminum pans. It was time to mix the "paste" and begin dipping each strip of paper into the pan to then adhere it to the balloon. Most of the children loved submerging their hands into the flour mixture, feeling the texture and coolness of it. They remarked on its smell, like that of pancakes. A couple of them were hesitant to touch the paste and "get their hands dirty," but eventually they relinquished. When the balloon "bowls" were complete, I had smaller balloons available for students to paper mache and create ornaments. By the end of the class, everyone was having fun with the extra balloons - inflating them, popping them, and taking a few home for later. It felt like a party. It was fun, and that's the way art should be. That's the way life should be. The first steps of creating a paper mache "balloon bowl"
The Young Artists of Florida program was created by Thomas Ris, a local businessman and arts supporter. It is made possible through donations, the Public Art Project, the Museum of Fine Arts, and local volunteers. One of the benefits of receiving a Creative Pinellas grant is the opportunity to meet with a mentor throughout the grant period. And, as an added bonus, I was able to request a specific artist whose approach resonated with me. I chose an artist whose devotion to her work is evident in her history of showing and creating. I chose an artist who specializes in installation art. You may ask how this type of art relates to what I do, and it really comes down to the ability of a piece of art to transform the space where it lives. While I currently rely on two-dimensional paintings to achieve this goal, I also plan to venture further into this realm of thought-provoking, three-dimensional projects. Thus, meet Babs Reingold. "Hung Out in the Projects" uses space to direct our attention to the over-abundance of poverty. Rust and tea-stained fabrics hang from clotheslines strung between old windows while the lights fade on and off intermittently and sounds of city noises play from a boombox in a trash cash. By transforming space in a monumental way, Babs gives us an "alternate reality". On a daily basis, we see news on the internet or in the headlines of newspapers about the destruction of our environment and about poverty, but those sources are easily overlooked or discarded with yesterday's news. Art installations of this grandeur, on the other hand, insist we stop and think. I greatly admire her ability to weave relevant materials together in a way that shows us just how humanity's presence is acting and evolving. The art asks the questions, and we must provide the answers. I am honored to have Babs as a mentor, and I thank her for carrying me on her back for a couple of months to show me the ropes. 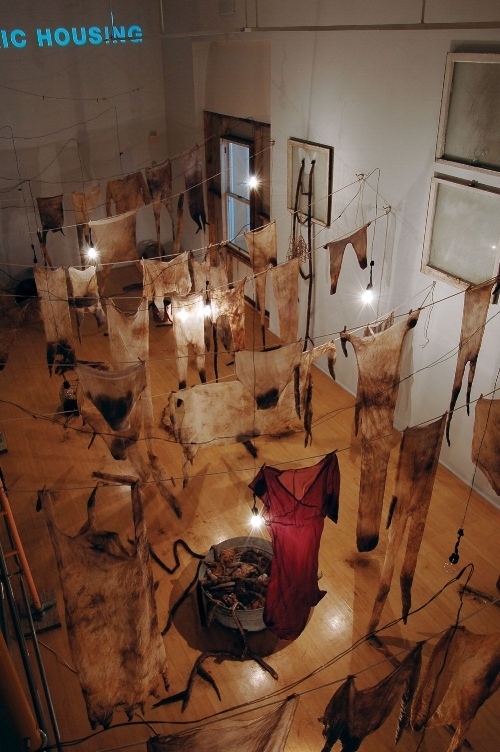 Her installation is on view through October 1 at the MFA in St. Petersburg. Visit her website at babsreingold.com. Hurricane Irma passed through St. Petersburg during the early morning hours of September 11, 2017. I was awake with my family, listening to the sound of the wind's push and pull at the windows, while outside the trees bore the storm as best they could and as their roots and branches would allow. The lights flickered, but by some miracle, we retained power throughout the night. The eye moved past us at just about 20 miles to the east, sparing our city from the brunt of the storm - a blessing for which I am still giving thanks. The days leading up to the storm saw the city's population in a caution-turned-frenzy type of preparation. Everything was put on hold, and the priority became to secure water, food, and our homes. The possibility that we could face devastation became a real threat. It was a time to identify which possessions were most important and resign myself to the idea of letting go of everything else. I hope you and yours fared well. At the end of the day, all we have is each other. UPDATE: THE RECEPTION FOR THIS EXHIBIT HAS BEEN RESCHEDULED! The first time I saw San Francisco was from the window of an airplane. Thick clouds hung suspended over the city and above them was bright blue sky. When I walked out of the airport, the crisp, cool air was so refreshing from the humid summer I had left behind in Mississippi. It was September 2011, and I was there to explore the coastline. I drove the Pacific Coast Highway over the course of a week and photographed the landscape as I traveled. The photos from that trip were the start of a series of large-scale paintings which I would spend the next six years creating. During my time in California, I fell in love with the rugged coastline, the steep and immense views, the sound of the crashing waves, the deep color of the water, and especially the fog. The fog quiets the atmosphere and softens appearances. It became a fascination of mine to represent the fog as I had experienced it. It took years to finish all five of the paintings I set out to create because, well, life takes its turns. But my focus kept returning to this work and to my goal of seeing them completed and exhibited together. And, as of the past month, I am proud to say that I have finished the fifth painting, the one shown here. And if that weren't enough to celebrate, I have also come upon an opportunity to exhibit the complete series through October. Pictured below is "Big Sur II," as seen in the spacious and modern lobby of the Hermitage Apartment Homes at 151 7th Street South in St. Petersburg. Join me at the reception to toast this milestone in my journey and see the paintings in person. I look forward to creating more images of the places I love. Thanks to Creative Pinellas, the Morean Arts Center, and the Hermitage for helping to make this possible. Art is more than paint on canvas. Art is a way of life. How we greet each day, how we express the many ideas and emotions within us, and how we choose to spend time, all work together to sculpt our personal story on earth. So, in a way, we, as humans, are all artists. But not all humans call themselves artists, so what is it about me that drives me to create paintings and to identify as an artist? In college I took a psychology course called 'Theories of the Creative Process.' In it, we studied writings by Sigmund Freud. In a work titled "Introductory Lectures on Psychoanalysis" he claims that an artist "makes it possible for other people once more to derive consolation and alleviation from their own sources of pleasure in their unconscious which have become inaccessible to them" (468). He suggests that artists, by creating a work of art, give their audience a door through which to access repressed or unexpressed ideas. The style which I have developed, called Abstract Precisionism, uses ambiguous forms and designs to compose a larger, unambiguous whole. The interpretation of the forms and designs can be personal to each viewer, and in a way, opens a door for the viewer to learn about his or her own identity. So, while we are all artists of life, working artists serve by providing a means through which the audience can shine light on the depths of their own minds. The painting shown here is called "Monterey." It is part of my large scale California series, sizing in at 4' x 5'. There is so much to be found in this painting. It is one of the more complex pieces I have done. In the cropped fragment below the main image, I see a woman who is reaching for a distant verson of herself, either smaller or in the past. What do you see? Born and raised in the flatlands of the Mississippi Delta, Elizabeth Barenis began painting at a very early age. Her parents, who owned a music store, nourished Elizabeth's creative spirit by enrolling her in private art lessons during childhood. Elizabeth completed high school at the Mississippi School for Math and Science, where, although math and science were the focus, she still received a painting award. Art continued to have a presence in her life throughout her college years at Sarah Lawrence College in New York, where she studied many subjects and techniques, including modern physics and analog photography. In 2004, after graduation and a summer at the Chautauqua Institute for Art, Elizabeth focused her efforts primarily on painting. Since then, she has been working to refine her style and develop her artistic career. She has been living and working in St. Petersburg since 2015. Elizabeth's subject matter is grounded in reality as it is derived from her photography. She describes her style as “Abstract Precisionism,” through which she generalizes forms using clean and precise lines. This technique, when observed closely, allows the viewer to connect the forms and discover a story, similar to finding shapes in the clouds. Yet from a distance, the distinct lines become less apparent, and the viewer can experience the feeling of the moment as a whole. Up close, it appears that everything is separate and endless stories abound. But from a more distant perspective, we see that each individual shape composes a greater whole and that there is but one story – that of connectedness. With the Emerging Artist Grant, Elizabeth plans to continue her current work of large scale California landscapes while also devoting time to gaining perspective through museum visits, discovering new inspiration through traveling, exhibiting in galleries when possible, and exploring new and grander ways to express the beauty of life through painting.